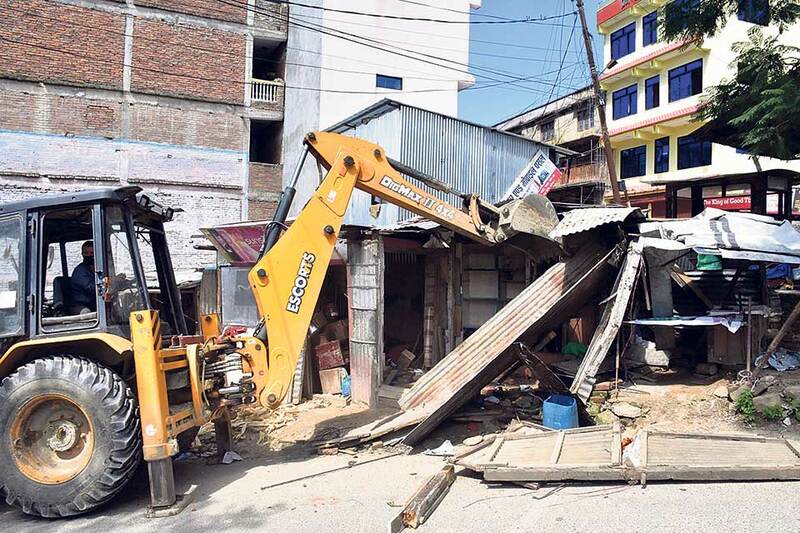 BANEPA, Sept 18: Illegal structures built along Dhulikhel-Nepalthok section of BP Highway are being demolished by the road project starting from Monday. According to the project office, they have been compelled to take action after those who received compensation did not remove the structures built by encroaching the highway but instead constructed further illegal structures. “We gave them clear information and sufficient time to evict the encroached areas. After they refused to leave, we saw no other solution but to demolish the illegal structures,” said Rakesh Maharjan, chief of the office. The highway, which runs through Dhulikhel and Namobuddha municipalities as well as Roshi Rural Municipality of Panauti, has dozens of illegal structures built by the locals. The project has long been making attempts to clear the road and its surroundings from illegal structures. However, the work had not progressed due to lack of local representatives. Maharjhan said they are now working to clear the encroached areas with the support of the chiefs of rural municipalities and municipalities as well as ward chairpersons. “We started removing the illegal structures immediately after they backed our efforts,” he said. Ward Chairman of Dhulikhel-11, Bishnu Dhital, said that the majority of people in the ward are in favor of demolishing the illegal structures as they have been an eyesore as well as causing road accidents. “There has been no opposition regarding the decision to demolish illegal structures along the highway,” said the ward chief. The project office has published notice stating that 169 structures along the 50-kilometer Dhulikhel-Nepalthok road section would be demolished. Such structures include houses, makeshift tents, and hording boards among others.